So, what to do in Listvyanka if just want to hike?? NUMBER ONE hiking route is Great Baikal Trail – GBT. It goes from Listvyanka to Bolshie Koty and further. Listvyanka – Bolshie Koty is the most popular hike. 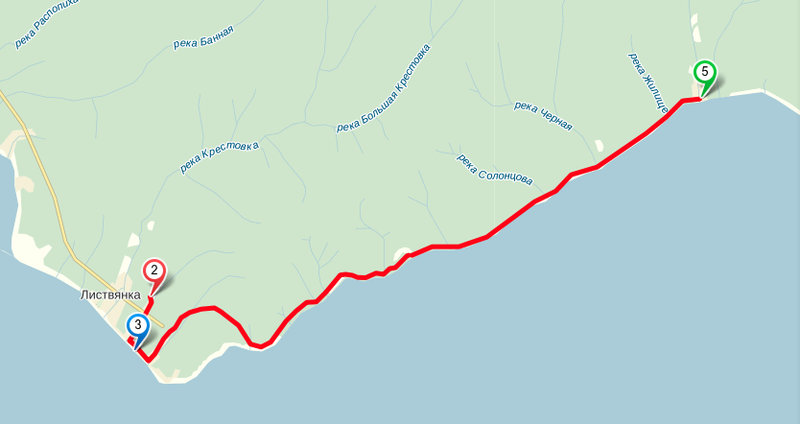 The 18km of the trail are covered within 6 hours. The trail goes mostly along the shore. The views are great! Even for a trained people, it is unite hard to walk there and back in one day. You should keep that in mind and plan your hike accordingly. 1) walk half way and return the same way. 3) walk to Bolshie Koty, overnight there at LESNAYA 7 HOSTEL , return to Listvayna by feet. To start you hike (please see the map below) you have to walk down to the main road from BELKA HOSTEL (2), turn left, walk along the main street, pass the “Mayak” Hotel (3), walk further and take the first left turn – Gudina street. BEWARE OF AGGRESSIVE DOGS IN LISTVYANKA! Keep walking up to Gudina street, pass a very expensive yellow wooden house (on your left side) , walk further till the road transforms to the trail: this is what you need. After that just keep walking without expecting to see any arrows, signs and other things you might see in other civilised countries. WE do not have that. 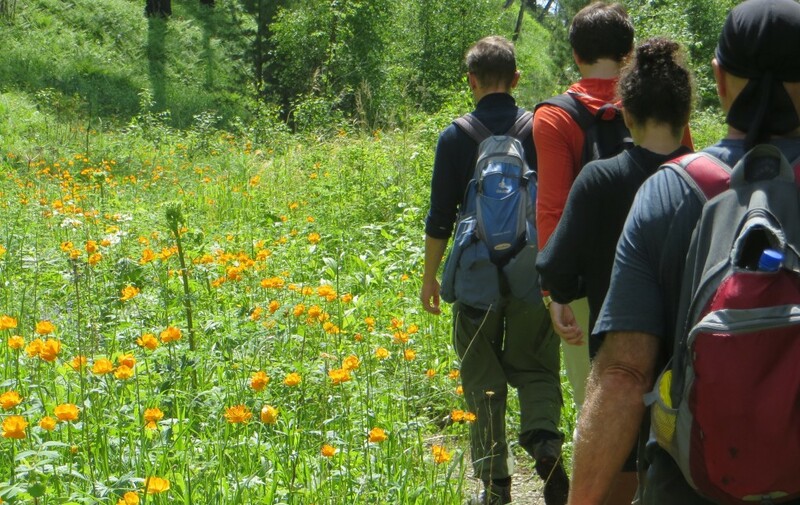 ANOTHER HIKING ROUTE is easier, walking only on horizontal surface, it is about full day walking. What’s good about it: you’ll have a short boat ride across the river (Angara), see port Baikal and walk along the Circum-Baikal Railway. A lunch box is required. 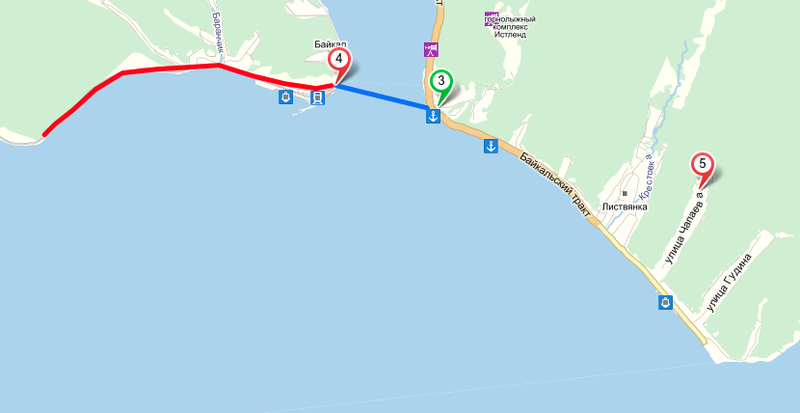 Step 1: You have to get to point 3 (Rogatka pier in frond of Baikal Museum), take a 8.15 AM ferry to port Baikal (blue line). Once there, it is recommended to climb up the hill to the old lighthouse for the view. Please note that if you stay at BELKA HOSTEL (5), and you walk to point 3, it is min 5 km and 1 hour walk, so you have pt leave the hostel at 7 AM! Step 2: Then you can walk along the old rail tracks (red line) to the tunnel (about 5-6 km). Make sure your are back to port bail by 4.15 PM or 6.15 PM.